I was lucky enough to get a moment of Mark’s time today. I managed to keep up my end of the conversation, or at least enough to let him go on about what makes him tick. He’s an Islay transplant and was and still is a wine merchant from London. Pretty great story on how he acquired the distillery and his change from wine to whisky. now sources barley from up to 28 different farms (increasingly organic/biodynamic) on the island, because he’s convinced that each farm’s location, soil, and weather can be expressed in a distillate. 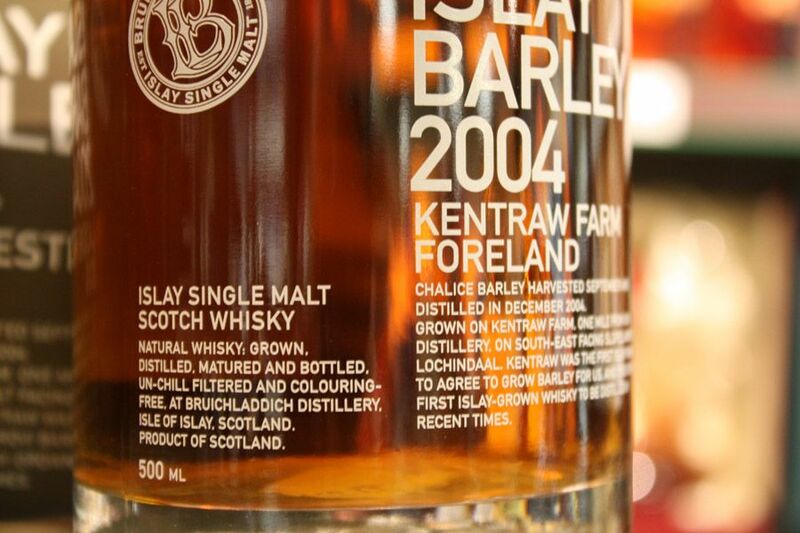 This meets up to 50 percent of their barley needs, the rest come from surrounding Scottish isles or the mainland. One reason that these guys source barley locally and mature casks on Islay is that it gives them the opportunity to try and express characteristics from an individual farm or a certain part of Islay. Bruichladdich also ages and bottles all of its whisky on the island (the only one on Islay that does both)– are you sure there’s no salty Islay air that gets in through that wood and into your glass? And that brings me back to the island. I like the idea that the barley used for this product put food on the table for a family living on Islay. There are so many things about Bruichladdich that impress me. There’s the Botanist gin, which was really just an experiment or being British, Mark wanted some gin. Either way it turned out to be great stuff. Botanist is made with 23 different Islay-specific botanicals along with english juniper, and it’s combined in a Lamond still, the only one left in existence. The still (dubbed Ugly Betty) is sort of a hybrid, and it maintained its temperature so well that they were able to reduce the heat to a really low temperature, so that the gin was able to simmer for 17 hours (the majority of distillations take 3-4)! It’s really, really special. Then there’s the biodynamically farmed barley, reusable waste from the distillery converted into energy, stimulation of the local economy, and a product that is the true spirit of Islay. Add all that up and combine it with the best barrels for aging (I’ve seen Latour, Petrus, Amarone, Buffalo Trace) and you have Bruichladdich. Oh, booze does have terroir – for the source product, for the fermentation (more in the weather/temp), for the aging, for the bottling. And that includes the quality and taste of the air, the vegetation, the climate, maybe even the people who made it. I don’t like liquor made by bad-smelling people. Kind of makes you wonder if the people that make Malibu are wearing to suntan lotion to work. Have you given any thought at all with converting your web site into Spanish? I know a several of translaters right here which would certainly help you do it for free if you wanna make contact with me. Hi sorry for the delayed response. I hadn’t thought of converting it. The blog has taken a back burner as I have been involved in a number of local projects. However I will be back at my post in just a few short months. Once upon a time my spanish was enough to get me through mexico, but it’s a wee bit rusty from all this single malt. Feel free to contact me directly if you have some insight as to I might go about this. Thank you!